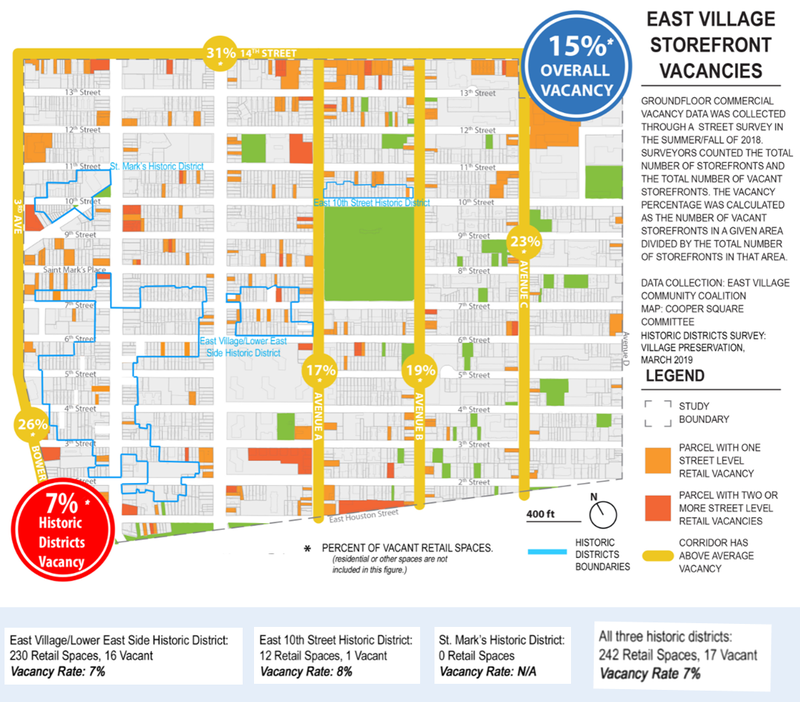 The percentage of retail vacancies in landmarked areas of the East Village were less than half the rate in non-landmarked areas – 7% vs. 15%, according to a survey released late last week by Village Preservation (GVSHP). This was consistent throughout the neighborhood – non-landmarked streets had consistently higher retail vacancy rates than landmarked ones, sometimes as high as 31%. By contrast, the East Village’s three landmarked districts encompassing about 400 buildings had 242 retail spaces with 17 vacancies and a fairly consistent retail vacancy rate of about 7%. The East Village overall has about 2,200 buildings with 1649 retail spaces and 250 vacancies, or a 15% retail vacancy rate. The findings of this new apples-to-apples survey undercuts claims by the Real Estate Board of New York in a study it released last year indicating that landmarking led to higher rates of retail vacancies. That study was based upon inaccurate data and assumptions, using a very limited comparison of one street in Hell’s Kitchen vs. a few cherry-picked streets in the West Village. This survey, by contrast, is the first neighborhood-wide survey of retail vacancies in New York City looking at comparable landmarked and non-landmarked areas. “While no study like this is conclusive, it certainly shows that historic districts and landmarked areas not only can but do thrive, even in this tough climate for retail in New York City,” GVSHP Executive Director Andrew Berman said in a statement. The survey was conducted by the East Village Community Coalition, the Cooper Square Committee and GVSHP.